Tucked just a couple short blocks away from arguably the busiest stretch in East Aurora, you’ll find a towering wooden building that resembles an old mill. 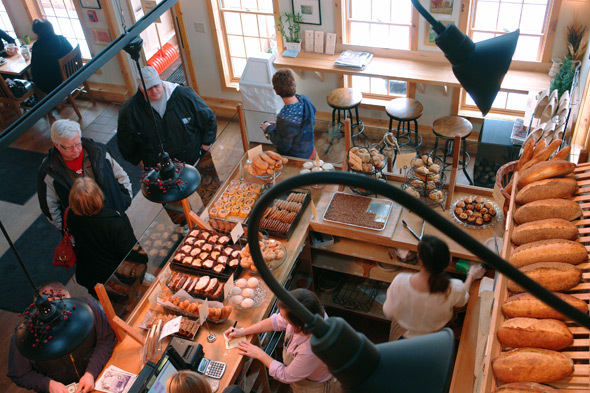 It is an old mill indeed, modestly dressed inside and out with rustic yet chic wood, and completely re-imagined as a bakery and cafe. Elm Street Bakery (72 Elm St., East Aurora, NY) is right off Main Street in the heart of the village, and I assure you it’s a place that’s worth driving to if you don’t live nearby. Fresh. Wholesome. Local & Seasonal. That’s their motto, and I like it. In fact, I applaud it. 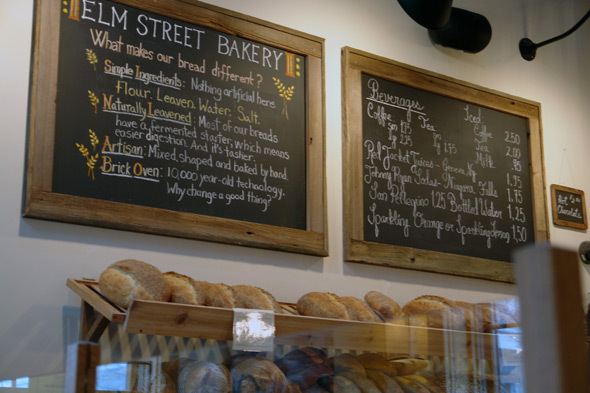 Before ever walking into the place, I hoped I would really feel it in every part of Elm Street Bakery, and I did. You immediately get a sense that how they operate as a business created their mission — not the other way around. 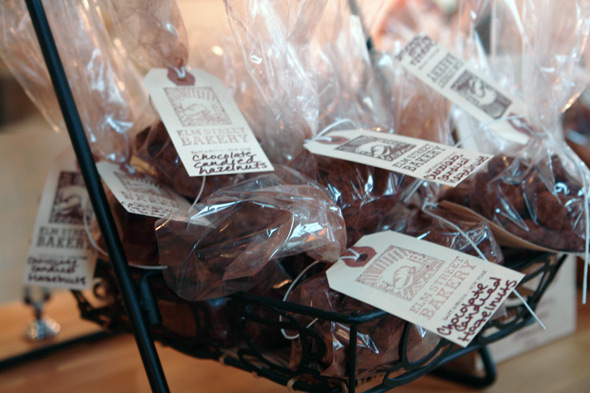 A family-owned business, they offer artisan breads, pastries and freshly-roasted coffee in their bakery area, and a plethora of lunch and dinner options: soups, sandwiches, salads and more in their cafe. 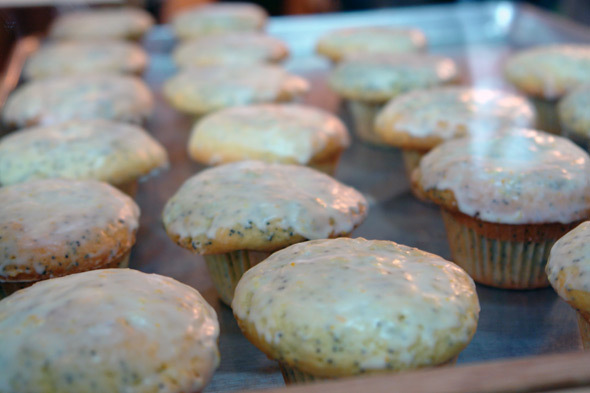 They use locally-grown vegetables and fruits in their dishes and sell local food in their market. 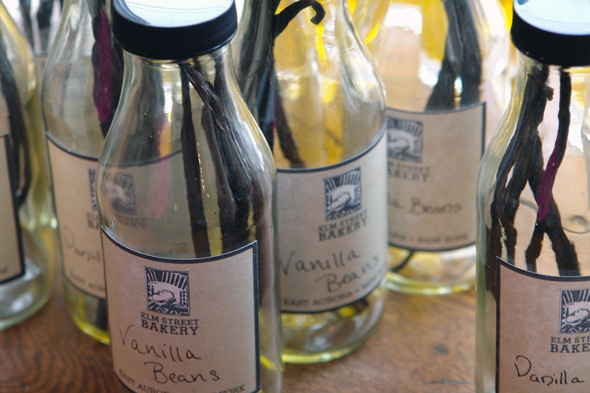 In order to feature seasonal, locally grown ingredients, their menu changes daily. I headed to the cafe area to check out the day’s lunch options. I had the carrot pumpkin bisque and the Asian edamame and chickpea hummus sandwich, served on three-seed bread. My soup was a smooth, creamy and hearty taste of winter. The warmth of the spices blended harmoniously with the carrot and pumpkin, and my bowl was topped with a tiny baguette round, smeared with goat cheese. 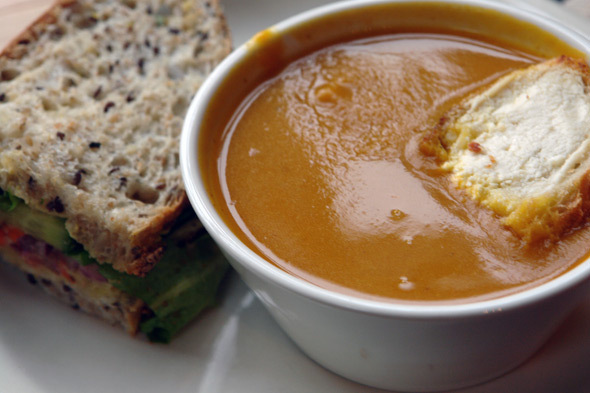 With a natural sweetness, but not an overpowering one, this soup was a lovely complement to my sandwich’s savory flavors. The nutty hummus and tangy, almost pickled-tasting veggies were delightfully fresh and crunchy — a favorite combination of mine on a sandwich such as this. Other soup options that day were baked potato chowder and 2012 power-up minestrone, and sandwiches included jambon beurre baguette and apple barbecue beef with cheddar and slaw. There were some tasty looking salad options, which ranged far beyond toppings on a bed of lettuce: roasted butternut squash, quinoa with balsamic roasted vegetables, and even a cheese and meat board. All categories had multiple vegetarian options available. The best part about the vegetarian options? They are thoughtful, deliberate choices that assure you they didn’t make a meat recipe and leave out that ingredient so they could call it vegetarian. I brought home an assortment of pastries to enjoy with my husband throughout the weekend: a pumpkin cinnamon bun, an almond bostock, a double chocolate brookie and a molasses cookie. The cookies were a great dessert last night after dinner, and although I loved the molasses and ginger of my cookie, I was impressed with the depth and richness of the brookie. 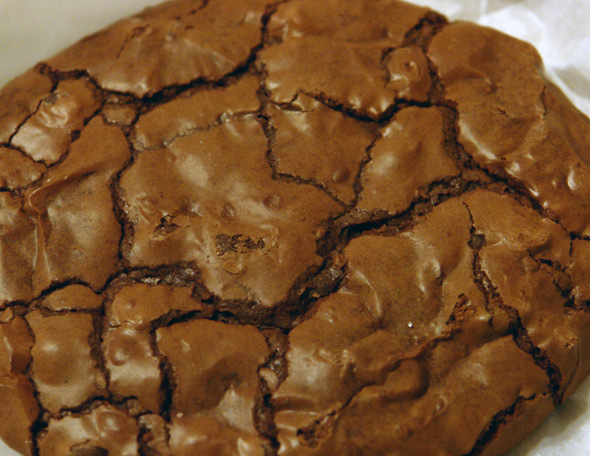 With a clever name to match its complex flavor, the hybrid brownie cookie was among the most true chocolate cookies I’ve ever tasted in my life. It reminded me of the best flourless chocolate cake I’ve ever had and evoked hints of some of my favorite pieces of chocolate ever, which I’ve melted down to make incredibly rich and not too sweet hot chocolate. My mom got the hot chocolate, and it had this same sophisticated chocolate flavor. The cinnamon bun, with a subtle pumpkin flavor and all the beloved trappings of a traditional cinnamon bun, was a treat we shared at breakfast this morning. The bostock is lovely, as we tasted a bit of it this afternoon, and wrapped up the rest to savor tomorrow. Next up, eating this one in Paris. I also purchased a loaf of the honey wheat bread for breakfast toast and sandwiches, and picked up some fresh roasted Indonesian coffee for my husband to sample. We are enjoying working our way through both, and I’m fairly certain we’ll be back for more of everything soon. 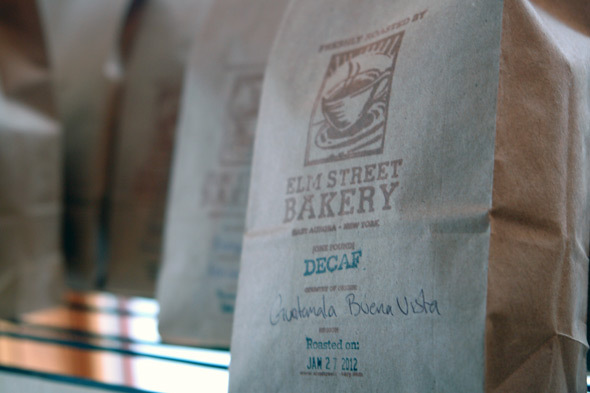 Elm Street Bakery’s current hours are Tuesday-Friday, 7 a.m. – 7 p.m.; Saturday, 8 a.m. – 7 p.m.